(Nanowerk News) Scientists are using Diamond Light Source, the UK's national synchrotron facility, to discover how we can detoxify our electronic gadgets. Results published today in the journal Applied Physics Letters ("Electric-field-induced phase switching in the lead free piezoelectric potassium sodium bismuth titanate") reveal the potential for new artificial materials that could replace lead-based components in everyday products from inkjet printers to digital cameras. 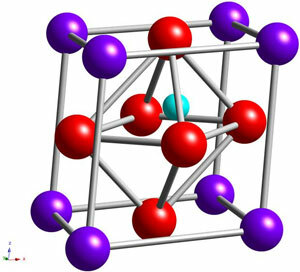 Crystal structure of KNBT before the application of an electric field. The purple spheres are either sodium or potassium atoms, the red spheres are oxygen atoms, the small blue sphere is titanium. The figure shows the arrangement of the atoms in a rhombohedral structure, where the a, b and c axes are of the same length and rhombohedral angle is less than 90. Researchers from the Institute for Materials Research at the University of Leeds' Faculty of Engineering used the Diamond synchrotron to investigate the structure and properties of piezoelectric ceramics in order to develop more environmentally friendly alternatives to the widely-used but toxic ceramic crystal lead zirconium titanate (PZT). The team used the I15 Extreme Conditions beamline at Diamond to probe the interior crystal structure of the ceramics with a high-energy pinpoint X-ray beam and saw changes in the crystal structure as an electric field was applied. 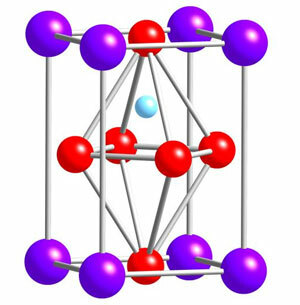 Their results demonstrate that this new material, potassium sodium bismuth titanate (KNBT), shows the potential to perform the same job as its lead counterpart. Dr Tim Comyn, lead investigator on the project, said: "These results are very encouraging. Although harmless when in use, at the end of their lifetime these PZT gadgets have to be carefully disposed of due to their lead content and as a consequence, there is significant interest in developing lead-free ceramics." Piezoelectric materials generate an electrical field when pressure is applied, and vice versa. For example in gas igniters, like those used on ovens and fires, a piezoelectric crystal creates sparks when hit with the hammer. Crystal structure of KNBT after the application of an electric field. The purple spheres are either sodium or potassium atoms, the red spheres are oxygen atoms, the small blue sphere is titanium. The figure shows the arrangement of the atoms changed into tetragonal symmetry, where the a and b axes are of the same length and the c axis is longer. In an electrical field, it undergoes a phase transition, that is changes in the crystal structure. The team will continue to work at Diamond to study the electric field induced transformation at high speed (1000 times per second) and under various conditions using state of the art detectors. Adam Royles, PhD student on the project, said: "Not only could a lead-free solution mean safer disposal of electronic equipment, by virtue of the absence of lead, these new materials are far lighter than PZT. The piezoelectric market has applications in many fields, where a lighter lead-free alternative could make quite a difference." In the medical field, PZT is used in ultrasound transducers, where it generates sound waves and sends the echoes to a computer to convert into a picture. Piezoelectric ceramics also hold great potential for efficient energy harvesting, a possible solution for a clean sustainable energy source in the future. Lead-based electronic ceramics are one of only a few exemptions to the European directive on the restriction of the use of certain hazardous substances in electrical and electronic components (2002/95/EC). This exemption will be reviewed again in 2012.